These are my last shows for the year! I just finished another successful Gaithersburg,Md show. I'm off to Covington,KY for a thanksgiving show. Only 2 more shows! In January I will post lost of new work on my Etsy site. I'm home from Hartford,Ct! Only 3 more shows to end out my year. I'm off to Gaithersburg,Md on Thursday. I hope the weather is good because my space is outside in a barn. I hope to see my regular customers there! I'm off to make more beads! Today my female cat "Barbie" died. I found her in my living room looking like she was sleeping but she wasn't. She was only 8 years old. I feel really sad. Her brother keeps looking for her. Poor thing. I leave tomorrow for my show in Oaks,Pa. Wish me luck. Somerset,NJ was a great show! Thanks to all my customers. I'm off this weekend to Oak,Pa. Only 5 more shows left for the year! 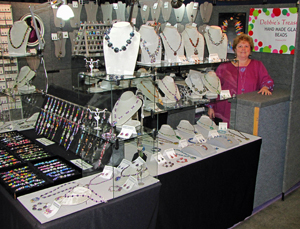 Check out my focal beads & vintage keys on my Etsy site.Here's a pic of my in my booth!